Last Saturday evening we had a baby shower in Houston to attend so I got creative with my bike training plan. 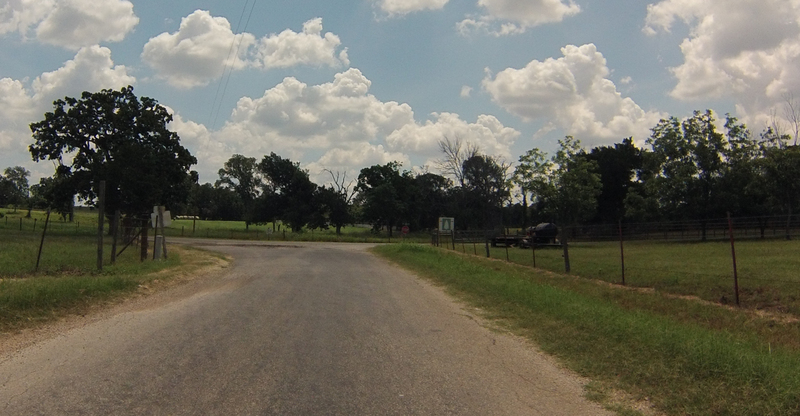 I decided to plan a route from my house out to Giddings, TX where my husband would meet me with our car. We would then head to Houston to try out a new brewery. It was, yet again, an adventurous ride. Luckily I enjoy adventures! I’m only one training weekend away from the Bike MS event Ride the Rim that I will participate in out in Canyon, TX on June 22nd. The ride is a 105 mile loop around the Palo Duro Canyon and I expect it to be awesome. I choose to fundraise for these events in honor of the many people in my life that I know that have been affected by Multiple Sclerosis. Please consider making a donation to the MS Society in support of my participation and to help the MS Society support those living with MS as well as fund valuable research so that someday (soon I hope) a cure is found. I will reward your donation with an awesome recap of my Bike MS adventure! 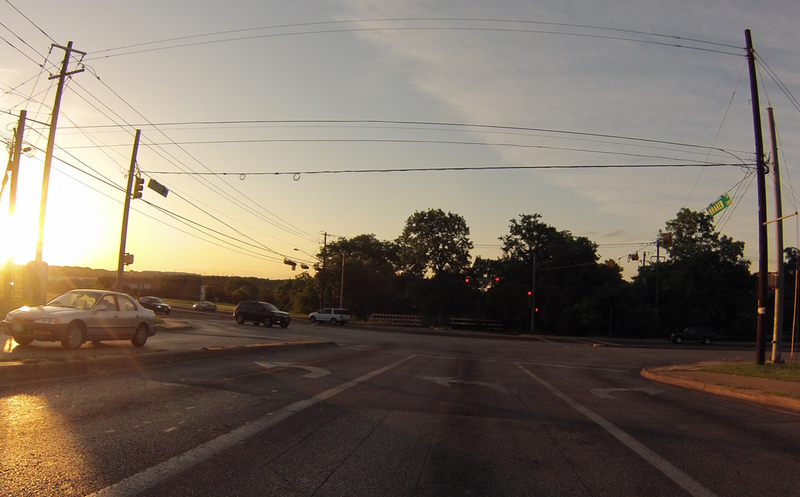 The sun was rising as I left, heading out Braker Lane to Dessau. Passed by Barr Mansion, a popular wedding venue in northeast Austin. Along New Sweden Church Road there is an old cemetery with a covered pavilion. 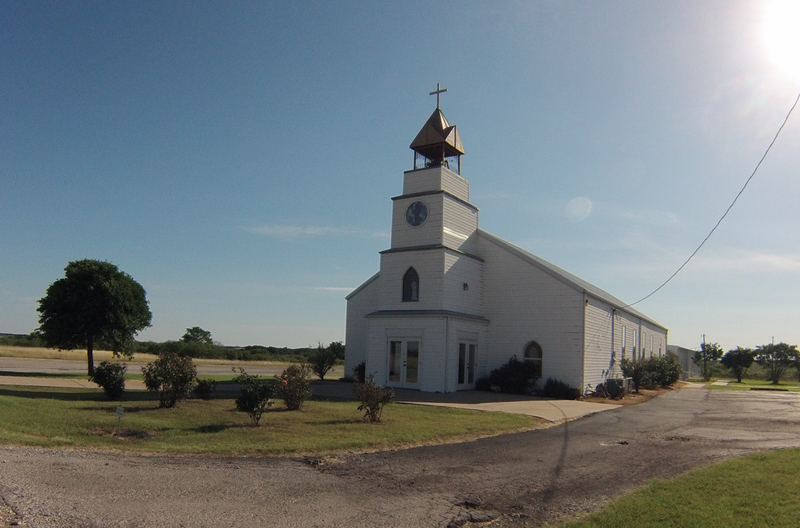 The New Sweden Church is always a recognizable landmark. The two room school house out on Manda Carlson Road has recently been repainted. Apparently a solar farm is going to be built on Manda Carlson Road. There were multiple signs. 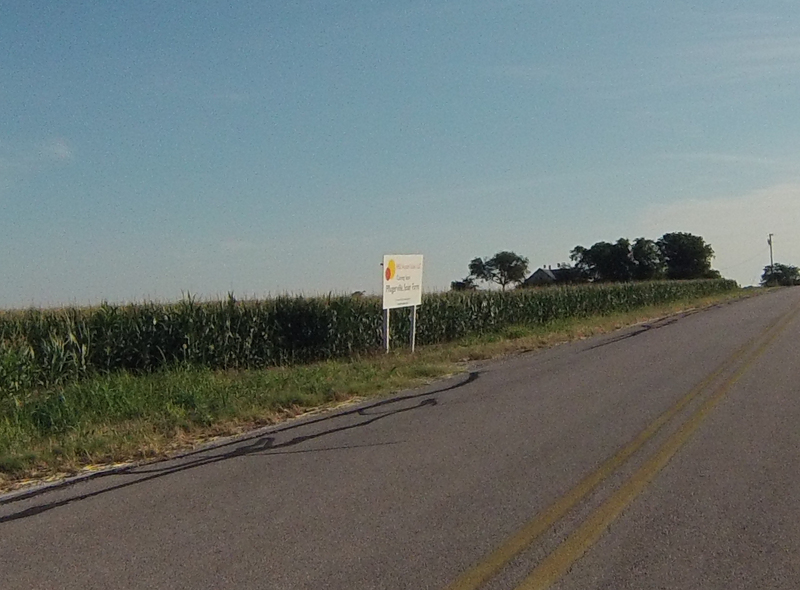 I passed up some gigantic fields of sunflowers and failed to get a photo. Instead, I took a picture of these sunflowers along the roadside. My first planned rest stop in Coupland, about 28 miles into the ride. I had to make sure to plan the route to go by places I could buy water. 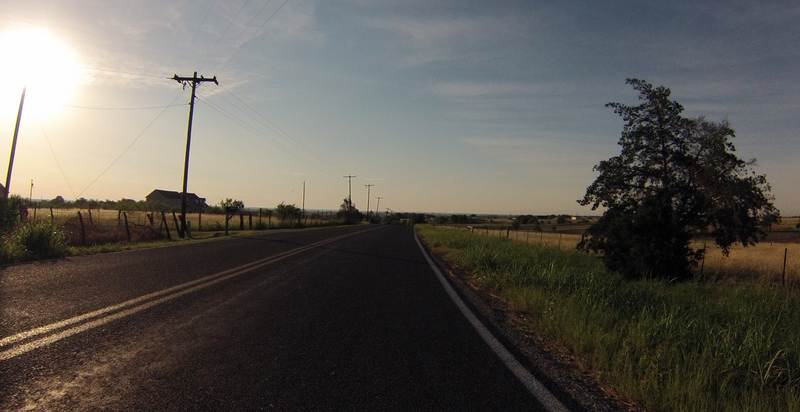 The road into Coupland had a bit more traffic than I would have liked, but at least it was early. My first dirt road wasn’t so bad. Fairly compacted and I was on it for a pretty short distance. Not too many turns later I ended up on a red-colored dirt road which was more like sand and gravel combined. It was awful. Again, not marked on the map as being a dirt road. Unfortunately the paved road just ended and I had no where to turn to avoid it. It dramatically reduced my speed. 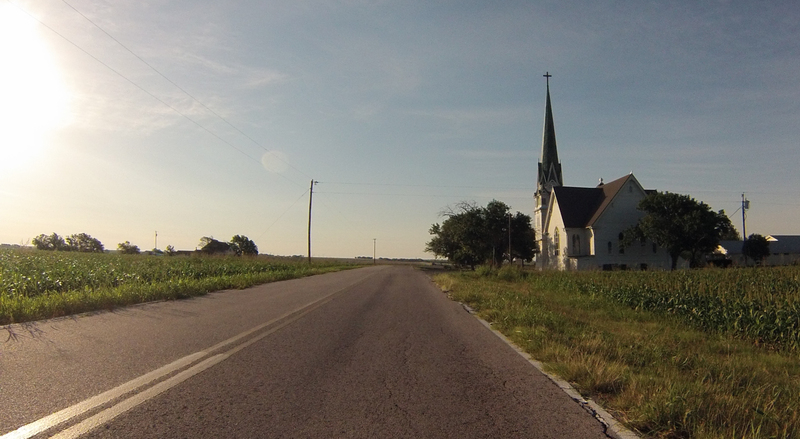 Finally off of the dirt for a bit, I pulled over by this church to have a quick snack. Riding on dirt takes a lot out of you. 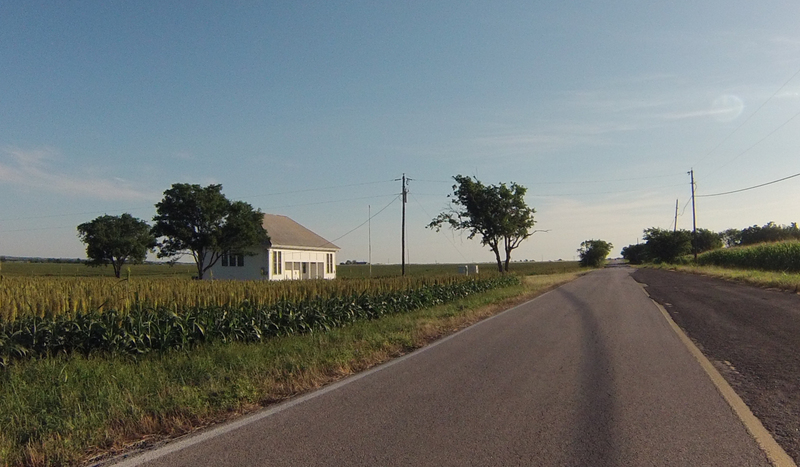 I was really out in the country at this point and really glad to be back on paved roads. There was no traffic, lots of pretty scenery, a number of deer, rabbits and jack rabbits. 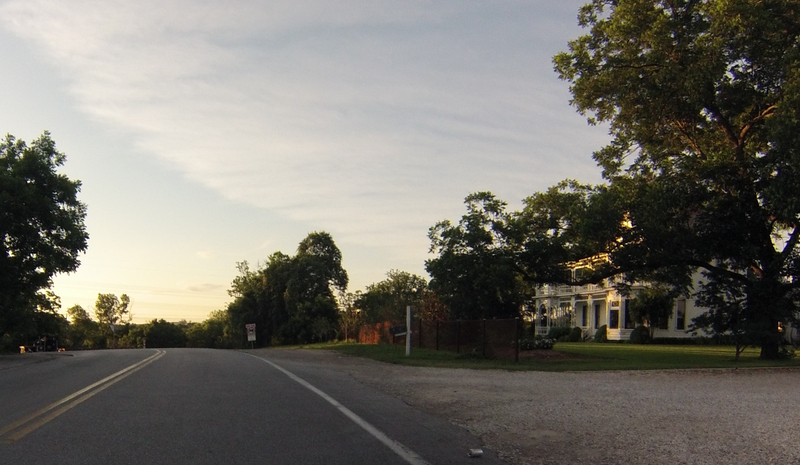 At some point I thought I got a picture of a deer crossing the road in front of me, but apparently I was too far away for the GoPro to really show the deer. And then the OK gravel turned into the nasty red sand / gravel combination again. I was certain I would fall at some point but managed to stay upright. I eventually came upon a huge mine near FM 696. The first part I saw was this giant pile of black earth (coal?). 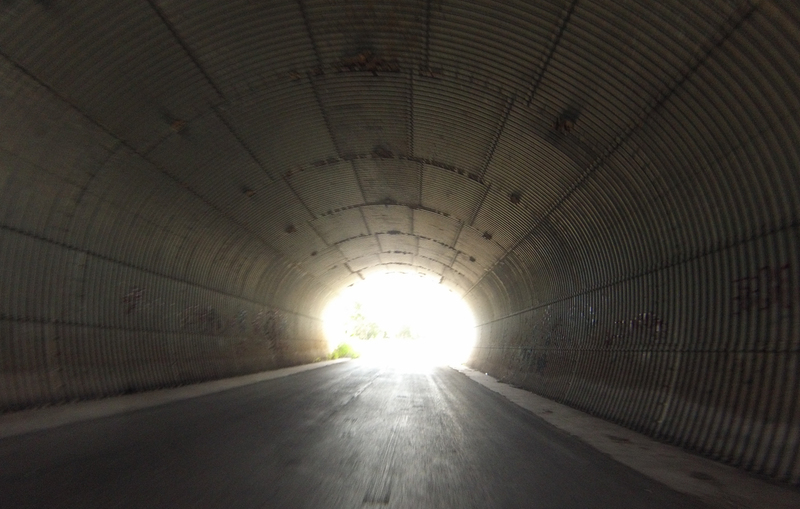 Then I went through this tunnel. The road above the tunnel is for the heavy machinery to go back and forth to the mine. On the other side of the tunnel I realized that there was an even bigger mine, probably a strip mine. You can just see the gigantic crane on the right side of this photo along the trees. 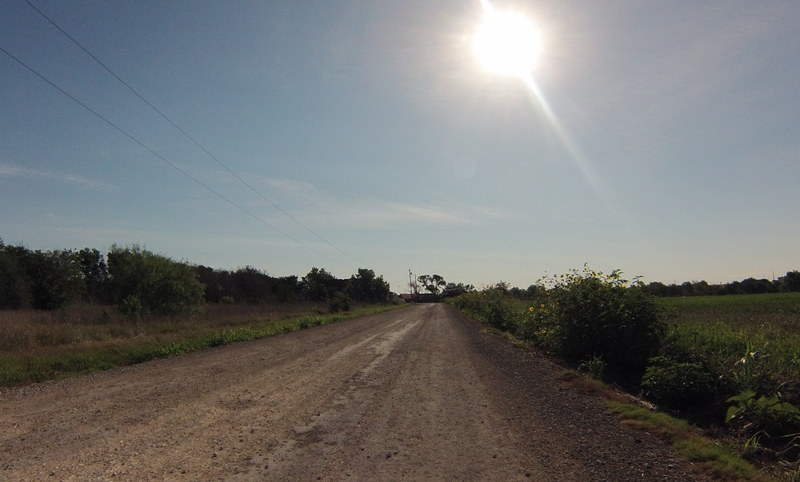 And then I hit dirt road again. I was so angry at the dirt roads at this point. I couldn’t avoid it but made the vow to turn off at the first paved road I came to. 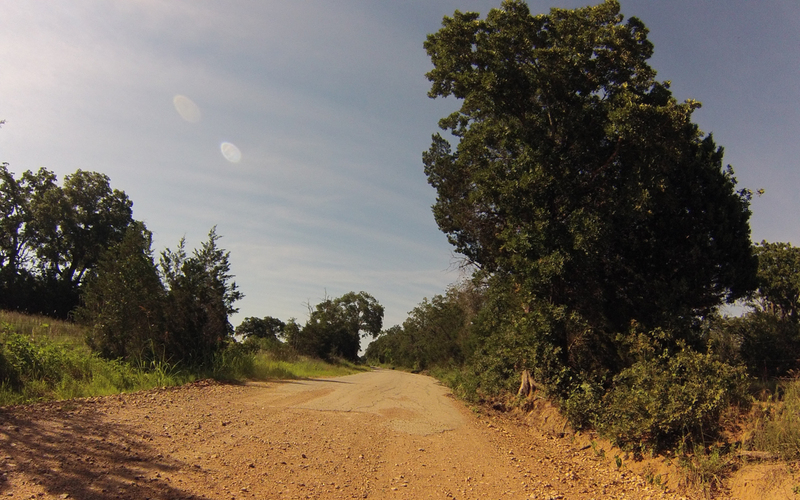 I probably rode at least 12 miles worth of dirt road throughout the morning. OMG! RED DIRT ROAD AGAIN! 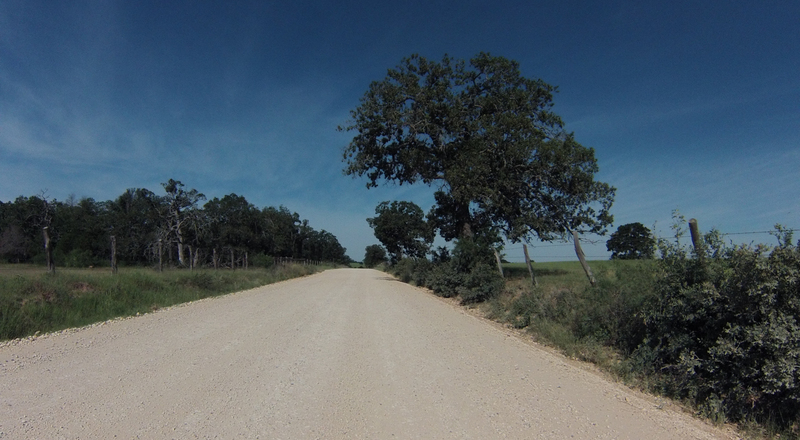 I came to a split in the road where my Garmin told me to go on a dirt road again. I was trying hard not to believe it and in the course of circling back to look closely at the road sign, the bike and I tipped over on the gravel, ever so slowly. Thank goodness no one was there to see it and I only have multiple bruises to show for it. 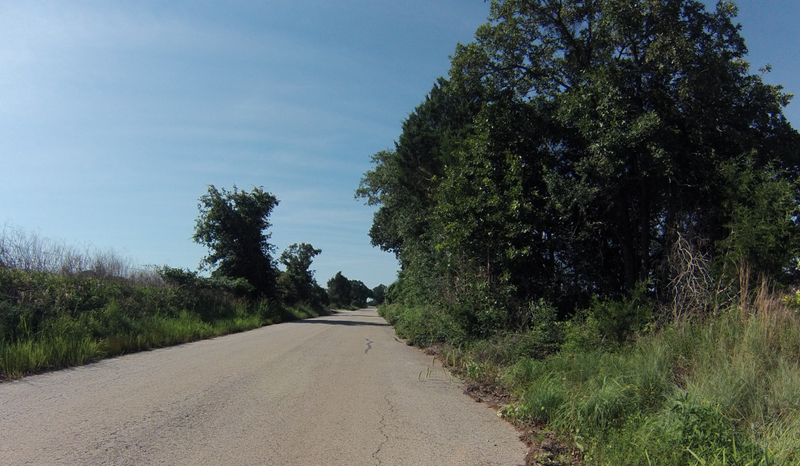 I consulted Google maps on my phone (thank goodness it worked) and determined that I could avoid this last section of dirt road by continuing on the paved road and then riding FM 696 a bit longer than I planned. 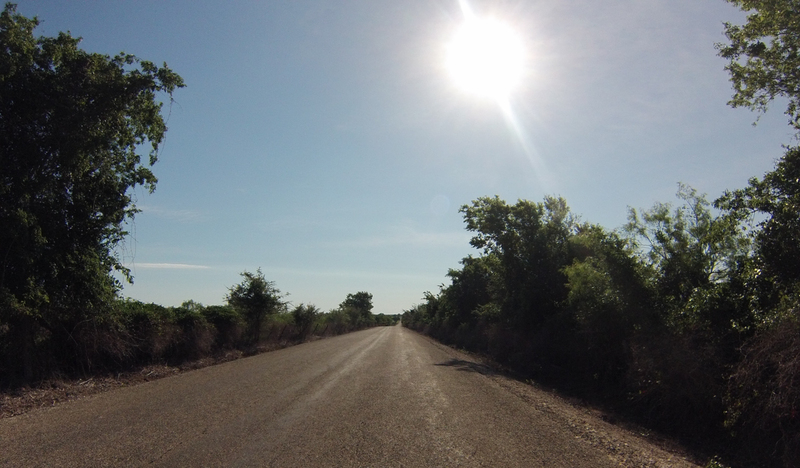 FM 696 is busier than the other country roads but it was totally worth it to avoid the stupid dirt roads. If you look very closely, you’ll see a road runner running along the road on the right side. My second rest stop was in a cute little country store / restaurant in Blue, Texas. Somewhere along here I stopped at my 3rd rest stop and had to call my husband and reconfigure the rest of my route so that I would end my ride in time to make it to No Label Brewing in Katy for their open house. I apparently gave up on taking photos around that time. It was quite toasty. Finished! 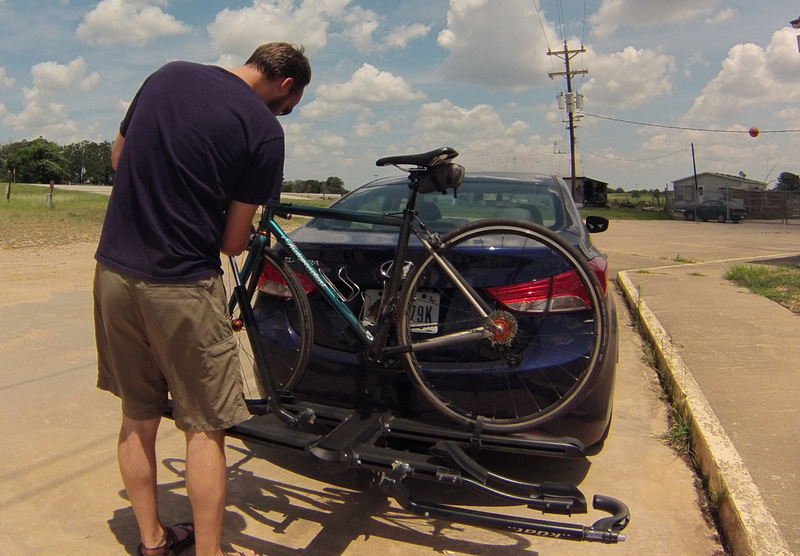 My helpful helper putting my bike on our new bike rack so we could continue on to No Label Brewing near Houston. My actual route ended up being 10 miles less than I had planned due to the time I lost on the dirt roads and trying to re-work my route to avoid the dirt roads. 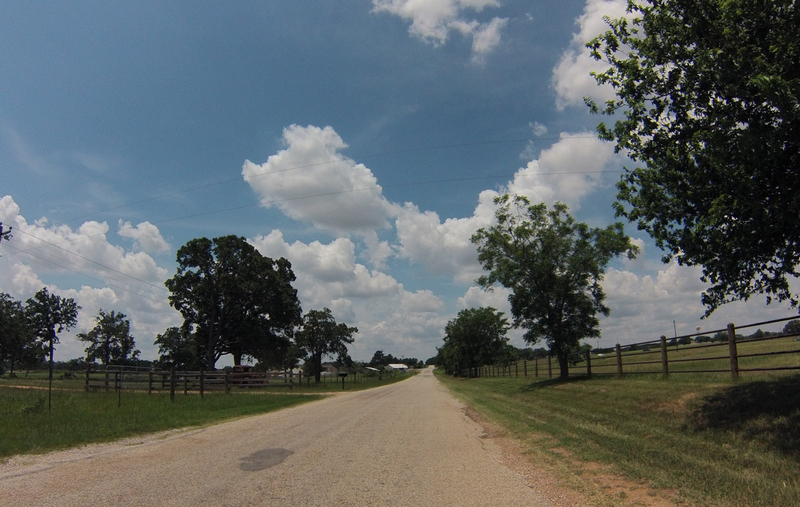 All in all, it was a pretty good ride on nice roads (the paved ones) with pretty scenery. No large hills to speak of. It’s always nice to ride on new roads.